Dates figs burfi is very easy to make and is very nutritious. 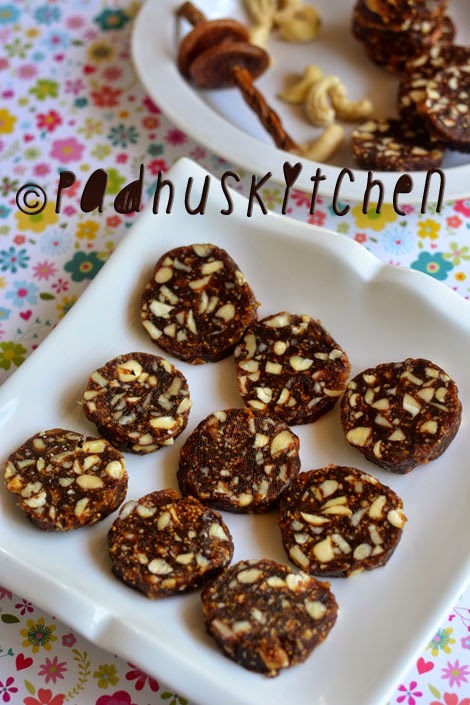 It is very healthy as it has no added sugar and is loaded with dry fruits and nuts. I always have this at home and eat 1 or 2 burfis whenever I crave for something sweet. Some of my other favorites are dates and nuts balls, sesame seed balls, peanut balls, pori urundai (puffed rice balls) and aval laddu. You can give these kind of snack to kids after they are back from school snacks or even pack it in their snack box. They are healthy and very nutritious. Today we will learn how to make sugar free dates and figs burfi following this easy recipe with step wise pictures. Roast the nuts in a kadai on medium flame. You can also toast the nuts in an oven. I used almonds, cashew nuts, few walnuts and hazelnuts. You can use nuts of your choice. Chop nuts into small pieces after roasting it. This is the hardest part in this recipe. I powdered 2 tbsp of nuts alone coarsely as it helps in removing the moisture if any, though it is not necessary. Remove the seeds and chop dates into small pieces. You can buy soft dates with or without seeds. I used dessert king dates. Then grind the dates along with figs to a slightly coarse paste. Heat ghee, add the dates+figs paste and cook on low flame stirring well for 10 minutes. Then add the chopped nuts and powdered (2 tbsp) nuts. Mix everything well and cook for a few more minutes. Remove from flame and leave it to cool. Then divide the mixture into 2 equal parts and shape it into cylinders as shown below. You can roll it on roasted khus khus if preferred. I did 2 batches. I rolled one batch on khus khus and for the other batch, I skipped that. (what you see in the main picture above is without khus khus). Refrigerate the cylinder shaped mixture for 2 hours or until it hardens. I sometimes leave it overnight due to laziness. After it hardens, cut it into rounds and store it in a container in the refrigerator. Shelf life - It stays good for 4-5 months in the refrigerator and for more months when stored in the freezer. I must try this. The sweet looks very appealing. Cook for a few more minutes or add more nuts. Tried this recipe for the first time on Dhanteras, hope all love it. It's a sugar free recipe and healthy. Looks really yum yum. I've tried this for second time today.... It's very nice, healthy and sweet :) Everyone at home liked this very much. Expecting more healthy food items. Can we use dry figs? Yes, you can chop it and add.